The engravers art has adorned high quality rifles since the beginning of rifle making and covers the spectrum from simple line engravings to highly ornate themes incorporating precious metal inlays which are shaped to perpetuate the theme the engraver has chosen. This engraving theme is usually dictated by the caliber of the rifle to be engraved ie. - a 505 Gibbs is usually engraved showing the biggest, most dangerous animals which the 505 Gibbs is intended to dispatch - Elephant, Rhino, Buffalo, Etc. While a 243 Winchester is usually engraved depicting various varments or deer sized animals. Occassionally Rifles are engraved depicting scenes which don't relate to the caliber - Western scenes, famous faces, logo's etc. the bottom line is that the engravers art can very as much as the imigination can imagine. The most important aspect of any engraving is the quality of the work. A poorly designed scroll pattern or a bear that looks like a pig can completely ruin a perfect custom rifle with fantastic wood, perfect checkering, flawless inletting, etc. It is very important to select an engraver whose work compliments the clients visions as to what is to be done with the confidence that the engravers will accomplish this vision with artistic precision. 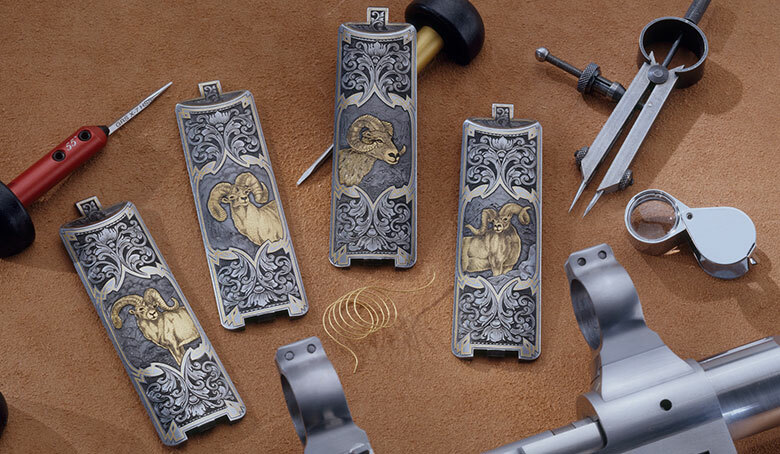 Mountain Riflery maintains close associations with several, what we consider to be, top quality engravers. Engraving slots have already been arranged for each year and some give Mountain Riflery priority status. Engraving should be scheduled well in advance as the best engravers have alot of pressure on their time.